The Lighthouse Shores condominium in Ponce Inlet offers the peaceful and serene oceanfront lifestyle you’ve been looking for. Located on a no drive beach, you will be able to enjoy the soft sands and crashing waves that make up your backyard, without the hustle and bustle of daily vehicle traffic. Inside the Lighthouse Shores condos you will enjoy postcard worthy views of the Atlantic coastline, with some residents enjoy gorgeous sunsets over the river from higher-floored units. This is a perfect second home, retirement home, or rental possibility where you can enjoy the convenience of onsite management. Call us today as Lighthouse Shores beckons you home. 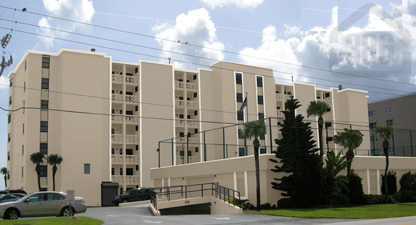 The Lighthouse Shores condominium in Ponce Inlet, Florida is located on a no drive beach. No cars are allowed on the beach in this area of Ponce Inlet. Each condo unit has a view of the Atlantic Ocean and higher floor units have views of the river.